The last couple of weeks have been disheartening for Bitcoin bulls. The currency has been on a move down. Is this about to end? The answer to this question determines whether the profits on our hypothetical positions are about to grow. The plunge began Sunday, with several factors possibly feeding into it, including a cyber-heist that hit South Korea’s Coinrail cryptocurrency exchange—even though no bitcoins were stolen—and a U.S. regulatory probe into Bitcoin price manipulation. Bitcoin’s price fell from more than $7,600 on Sunday to little over $6,100 on Wednesday, marking a four-month low for a virtual currency that has already fallen precipitously from its almost-$20,000 high last December. However, it seems that was the bottom for now. Early Thursday, the price jumped up above $6,500, and at the time of writing it seems to be holding at that level. The cryptocurrency-whisperers over at Coindesk reckon that, even if there is a brief rally now, the market remains bearish and Bitcoin may still fall below $6,000. That last happened back in February. We don’t necessarily support the idea that the news from Korea is behind the fall itself. It might have been a trigger but it seems that the move down is more an extension of a longer move down than anything else. The move down has been somewhat stopped recently. Is this a bottom? Here, we agree with the opinion that the recent action doesn’t really mean that the decline is over. So, what might be read as a rebound and a potential beginning of another rally, might actually be a short-term pause in between serious declines. Does the short-term situation support this view? 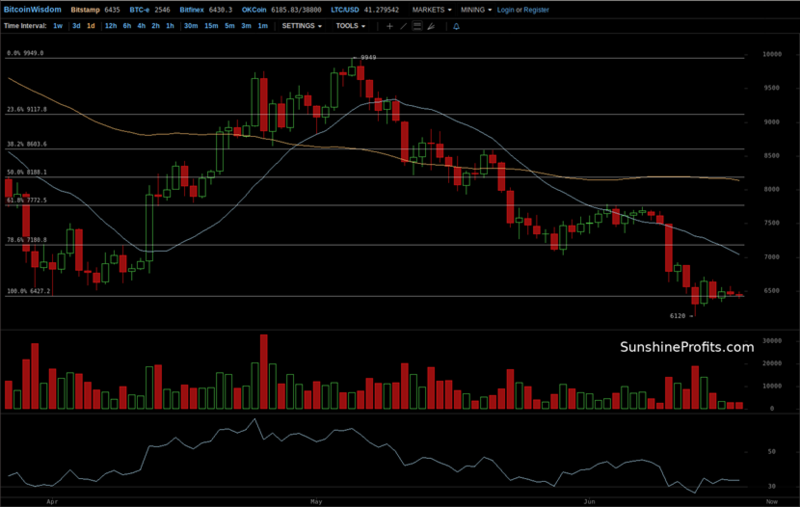 On BitStamp, we see that Bitcoin has stabilized around $6,500 and that the volume has declined. This is a bullish piece of news, right? Well, not really. If you tak a look at the Fibonacci retracement levels based on the April-May rally (lines with percentages on the above chart), we see that Bitcoin has come all the way down from the early-May top to the level of the beginning of the rally. This mean that the move up as a whole has been erased. This is a bearish indication. There’s more to that. Bitcoin is currently around $6,500, very close to the April 1 local bottom. Actually, the currency went below this level but came back above it. This, on the face of it, is a bullish indication. It might be one for the next couple of days. The RSI tells us that Bitcoin is not oversold any more, which also might be a short-term bullish sign. The problem with the above bullish signs is that they are shadowed by a very serious indication that the currency might be about to trip the wire and move down substantially. The long-term Bitfinex chart suggests that the recent action and the April 1 local bottom mentioned above might be important development as far as the long-term Bitcoin prospects are concerned. The above chart shows that the April 1 bottom (horizontal line in between the 78.6% and 100% retracements), together with the February 6 local bottom, form a support area at $6,000-6,500 which might be quite important for the long-term situation. And Bitcoin is right at the upper border of this channel. What this means is that we might see a breakdown below either of the boarders of this area, the $6,000 being the more important one, which in turn might produce pretty sizable moves. In other words, between $6,000 and $6,500 Bitcoin might fluctuate but it is also possible to see a deep decline from any point within this channel. The most important point is that the volatility might get hairy, so getting out of the market in anticipation of a correction to the upside, based on the short-term signs, might backfire as increased volatility could result in Bitcoin reversing, piercing down through the support area and declining substantially. The other thing to keep in mind is that below $6,000, the next important support level is $5,400, the November local bottom and the base of the rally which took Bitcoin close to $20,000. So, while it might be tempting to get out of the market at this point and wait for the currency to reverse, we are of the opinion that the potential volatility and the odds of a serious move down support hypothetical short positions. Instead of focusing on the next few days, we would rather have you focusing on the next couple of months and on the long-term prospects for your positions. Arguably, they are much more important and we would really enjoy your profits on the hypothetical positions growing even further. 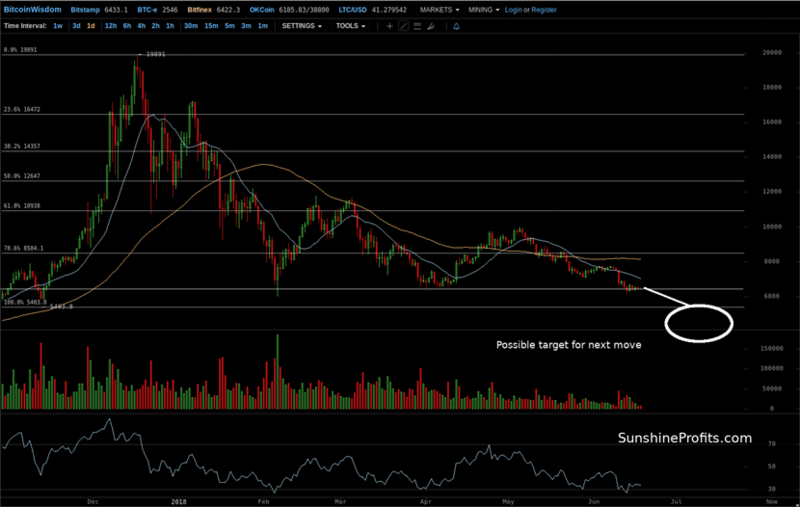 Summing up, the recent move up hasn’t brought Bitcoin far from $6,000, a critical bearish trigger. All essays, research and information found above represent analyses and opinions of Mike McAra and Sunshine Profits' associates only. As such, it may prove wrong and be a subject to change without notice. Opinions and analyses were based on data available to authors of respective essays at the time of writing. Although the information provided above is based on careful research and sources that are believed to be accurate, Mike McAra and his associates do n7ot guarantee the accuracy or thoroughness of the data or information reported. The opinions published above are neither an offer nor a recommendation to purchase or sell any securities. Mr. McAra is not a Registered Securities Advisor. By reading Mike McAra’s reports you fully agree that he will not be held responsible or liable for any decisions you make regarding any information provided in these reports. Investing, trading and speculation in any financial markets may involve high risk of loss. Mike McAra, Sunshine Profits' employees and affiliates as well as members of their families may have a short or long position in any securities, including those mentioned in any of the reports or essays, and may make additional purchases and/or sales of those securities without notice.